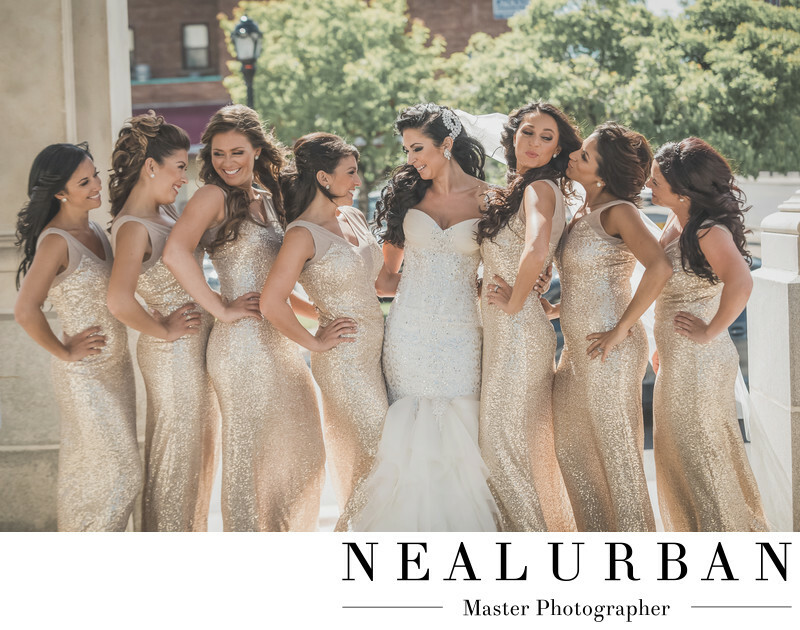 This bride and her bridesmaids are all so gorgeous! Look at those dresses! This was taken outside of the church for Jenna and Artie's wedding. The ceremony was at Our Lady of Victory Basilica in Lackawanna, NY. The bride and groom wanted to stay at that location for as long as we could for photos. It is said that the Basilica rivals churches in Italy. We like to make sure that everyone in the bridal party has a good time during photos. We know a lot of people hate that part and just want to drink on the limo. Not Jenna's bridesmaids. They loved the camera! We wanted some attitude and fun for these photos. We had the girls get nice and close. Then we have them all look at each other. It sounds kind of weird at first. But we always love to see the reaction of the bridesmaids. They begin to laugh and smile and gave us some great expressions. We love the bride's reaction. She looks so excited to be surrounded by her ladies! This location was off to the side of the Basilica. There are so many little outdoor walkways. We didn't want the entire image to be architecture either. We found the spot where we could get some trees in the back ground. This was only the start for photos with the bridesmaids. They had such a great time and we got some beautiful images! Then it was off to Niagara Square and City Hall in Buffalo for more photos. Then the reception at the Statler in downtown Buffalo!